Philip Larimore was born on January 4, 1925, in Memphis, Tennessee. He graduated from the Gulf Coast Military Academy in Gulfport, Mississippi, on May 17, 1942, and entered active duty on September 10, 1942. Larimore next attended Infantry Officer Candidate School at Fort Benning, Georgia, from September to December 1942, but had to wait until after he turned 18 to accept his commission as a 2d Lt in the Army on January 20, 1943, making him the youngest commissioned officer in the Army at that time. 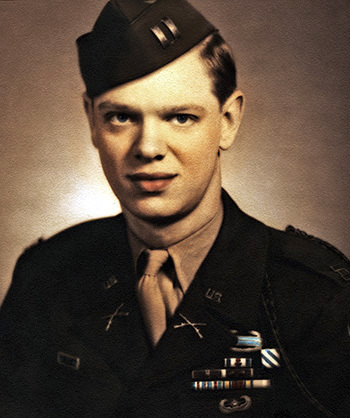 Lt Larimore served as Battalion S-1 and S-2 with 1st Battalion, and as a Platoon Leader with Company C of the 326th Glider Infantry Regiment, 82nd Airborne Division, at Fort Bragg, North Carolina, and at Alliance Air Base in Alliance, Nebraska, from February 1943 to January 1944, and then deployed to Anzio Beachhead in Italy in February 1944. 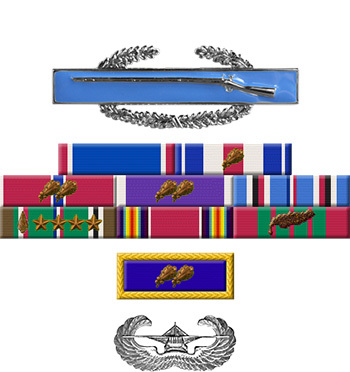 His next assignment was as a Platoon Leader with the Ammunition Pioneer Battalion and Headquarters Company, 30th Infantry Regiment of the 3rd Infantry Division from March 1944 to January 1945, followed by service as Commanding Officer of Company L, 30th Infantry Regiment from February to April 1945 when he was wounded for the 6th time and was evacuated back to the United States. During this time he participated in combat in Italy, Southern France, and Germany. Maj Larimore was a patient at Lawson General Hospital in Atlanta, Georgia, from May 1945 to May 1946, and then served as Executive Officer of the Ceremonial Detachment at Fort Meyer, Virginia, from May to November 1946. He was a patient at Walter Reed General Hospital from November 1946 until he was medically retired from the Army on July 12, 1947, after losing his appeal to remain on active duty in the Army as an amputee. After leaving the Army, Phillip completed undergraduate and masters degrees at the University of Virginia. He married and moved to Baton Rouge, Louisiana. He fathered four boys and served his entire professional career as a professor at Louisiana State University. A former Eagle Scout, as were his four boys, he was active in Boy Scouting (serving as a scoutmaster and being awarded a Silver Beaver Award). As a cartographer (map maker), Phillip published several books and co-founded the Louisiana State Geography Alliance (LaGEA) and founded and for years hosted the Louisiana Geography Bee. Philip Larimore died on October 31, 2003, and was buried at Port Hudson National Cemetery in Zachary, Louisiana. His wife of 54 years, Maxine Wilson Larimore (1926-2006) is buried with him. For extraordinary heroism in connection with military operations against an armed enemy while Commanding Company L, 30th Infantry Regiment, 3d Infantry Division, in action against enemy forces on 8 April 1945, near Rottershausen, Germany. Leading his company's attack, Major Larimore miraculously eluded the hail of enemy bullets concentrated on him and, in hand-to-hand fighting of which he was the center, killed a German officer at point-blank range. With the unit objective taken, he sent out a patrol Learning soon after that it was surrounded by enemy forces, he determined to got to its relief. As he ran toward a tank in which to move up, enemy snipers opened fire, but leaping on the back of the vehicle, he ordered it forward and manned the turret machine gun. Firing into the woods and killing several of the enemy, he drew hostile fire on himself as his patrol used the diversion to withdraw. Moving across a clearing with the tank, firing and being fired on all the way, he was struck on the helmet by a sniper bullet and momentarily stunned. Leaping from the tank, he was again hit by enemy fire and severely wounded. Major Larimore, by his heroic leadership and courageous action in diverting the enemy, delivered his comrades from encirclement and greatly aided in securing the battalion objective. Major Larimore's intrepid actions, personal bravery and zealous devotion to duty exemplify the highest traditions of the military forces of the United States and reflect great credit upon himself, the 3d Infantry Division, and the United States Army.